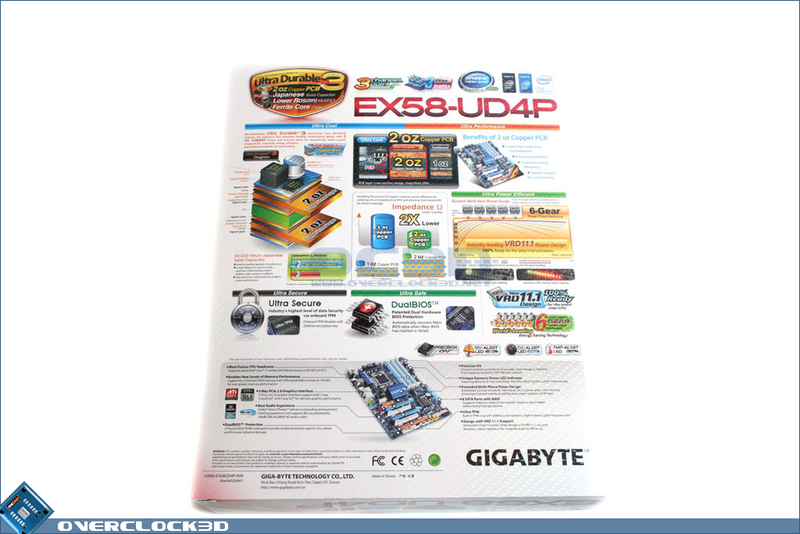 As with the Gigabyte EX58-UD5 (reviewed here), the UD4P is packaged in a white box with a holographic weave effect. 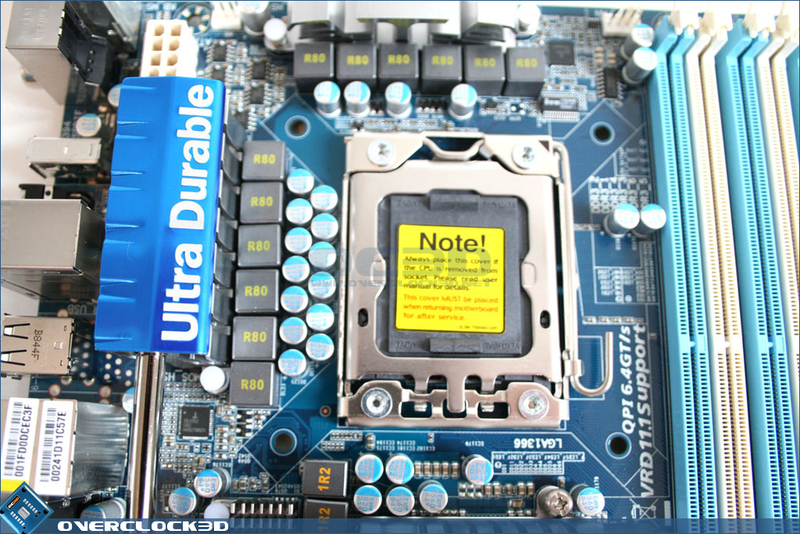 The front of the box is plastered with emblems and advertisements of the features of the motherboard. 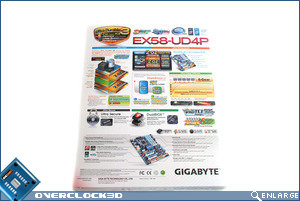 Taking pride of place though is the Ultra Durable badge informing the prospective buyer that the EX58-UD4P has 2oz of copper in the PCB, Japanese solid capacitors Lower RDS(on) Mosfets and Ferrite core chokes. 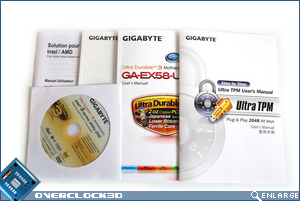 Flipping the box over we see that the features are explained in greater depth. 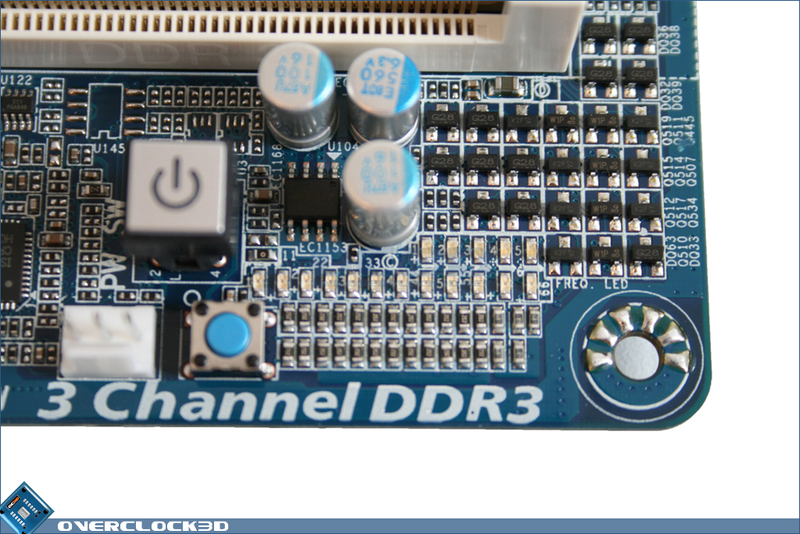 Despite the UD4P being a mid range board it's as feature packed as any high end board on the market at the moment. 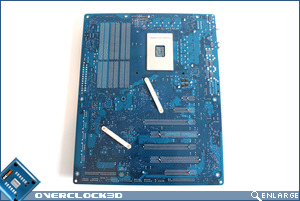 Removing the outer sleeve and opening the plain white reinforced box we come to the accessories of the motherboard. 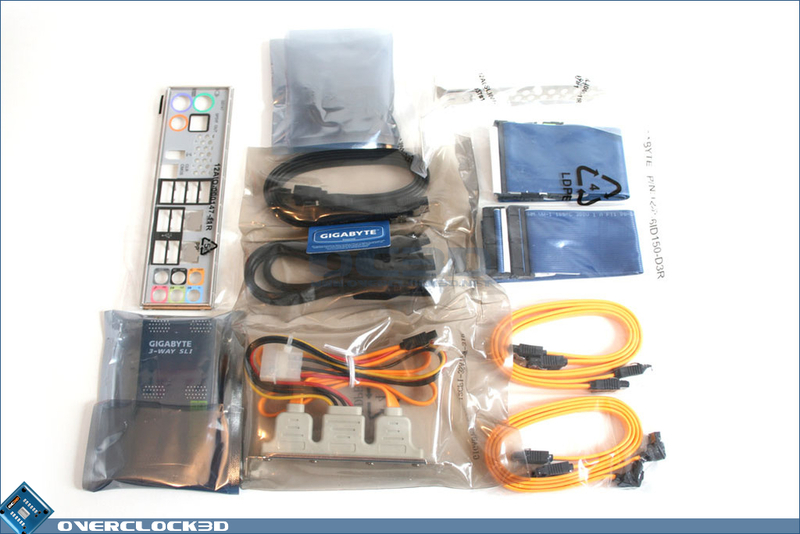 Gigabyte include an I/O shield, 4x SATA cables, e-SATA cables, IDE and floppy cables as well as a small (dual) and large (triple) SLI bridge. 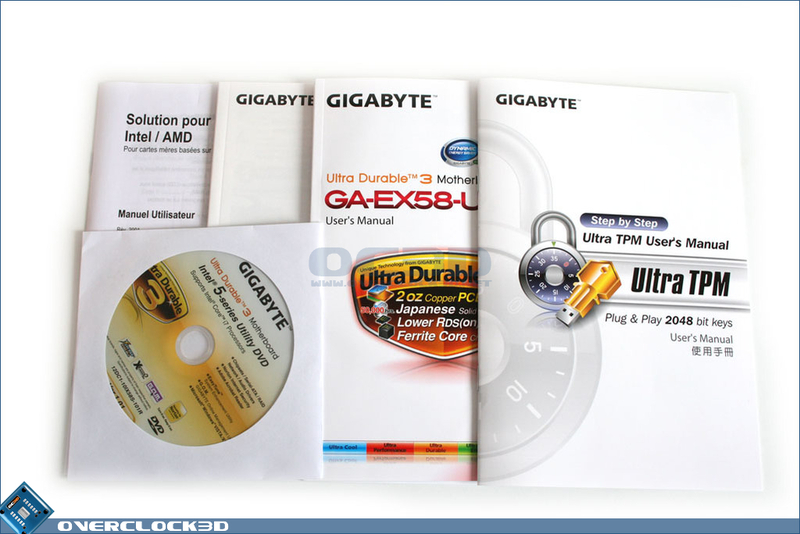 Aside from the obligatory driver CD and manual, Gigabyte also include 3 other manuals for you to peruse should you need further instruction on setting the motherboard up for the first time. 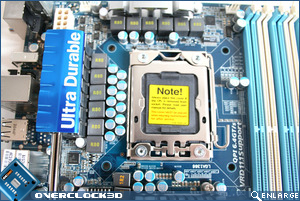 The motherboard itself is very similar to the UD5 but there are a few discreet differences. 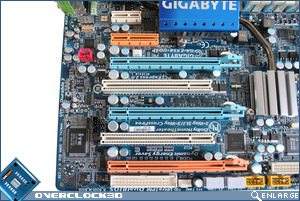 The colour scheme is the much improved blue/white affair but Gigabyte have still seen fit to throw a little extra colour into the mix with couple of orange PCIe slots. The only other ports that really stick out like a sore thumb are the USB ports. 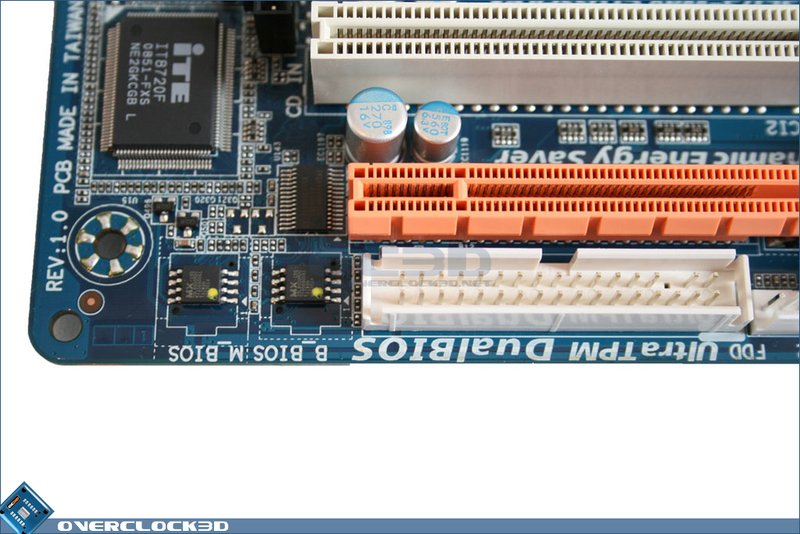 It's a crying shame that the whole board could not be matched up to one colour scheme as the blue/white is very attractive, spoilt only by the orange and yellow ports. 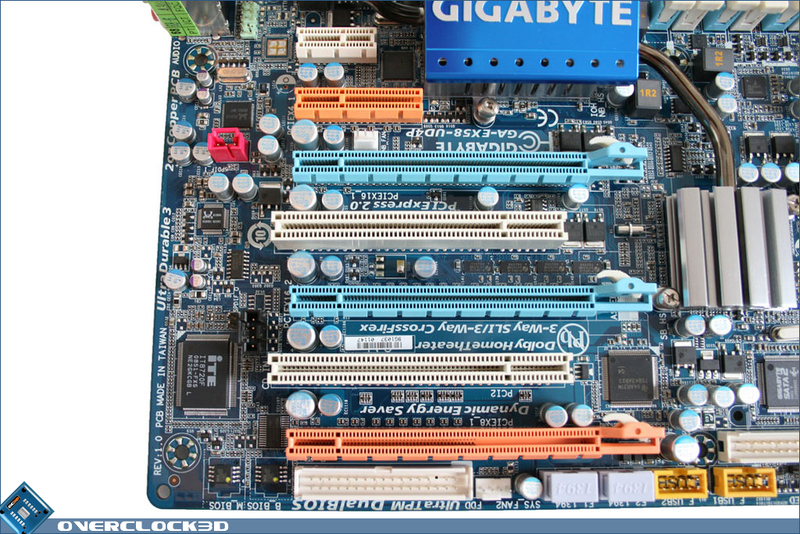 Still this is a far cry from the days of the rainbow coloured Gigabyte boards of old so they are to be applauded for that. 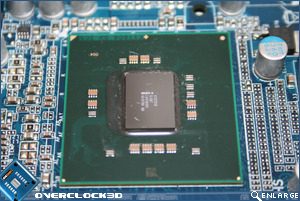 The CPU socket area is very cluttered thanks to the 12 Phase power delivery. 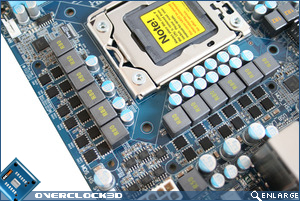 All of the chokes are ferrite core ensuring stable clean power is supplied to the CPU even under the highest load conditions, this along with solid capacitors should also ensure that the motherboard will still be going strong long after the socket has become obsolete. 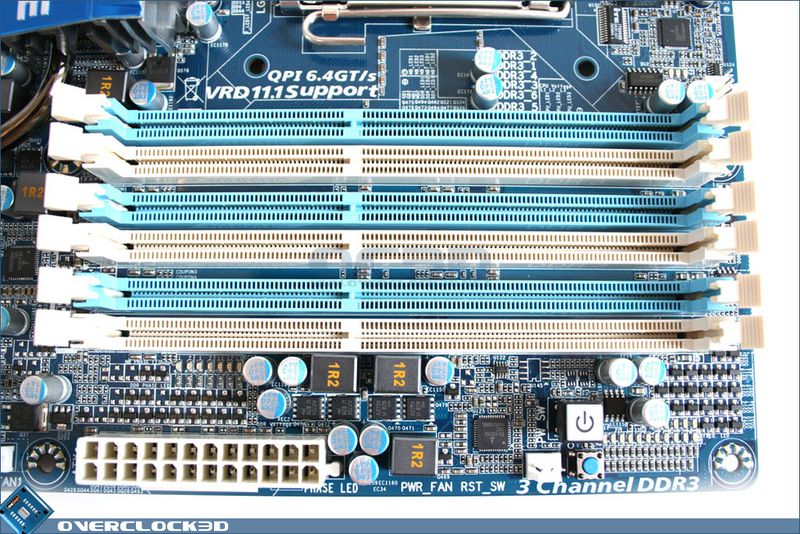 The six memory slots support triple channel DDR3 up to a maximum of 24GB. 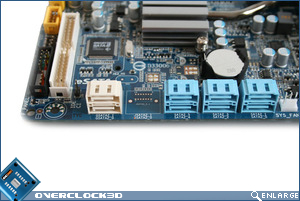 Onto the PCIe area and we find that from top to bottom there are: PCIex1, PCIex4, PCIe 2.0 x16, PCI, PCIe 2.0 x16, PCI and PCIe 2.0 x8. 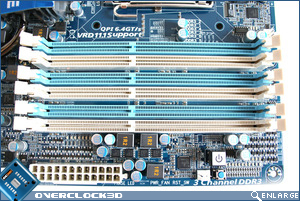 All of the 16/8x PCIe slots are CrossfireX/SLI compatible and both the blue slots will provide the full 16 lanes. However, when a third card is added to the bottom slot then the second blue slot along with the orange slot drop down to 8 lanes. 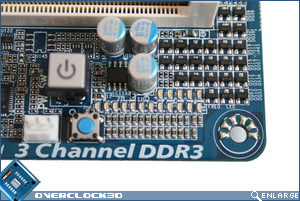 At present this has very little effect on todays GPUs as there is no requirement for 16 lanes on PCIe 2.0. 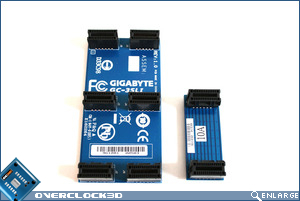 8x PCIe 2.0 provides roughly the same bandwidth of PCIe 1.1 x16 so this is a bit of a none issue. Perhaps only the dual GPU cards would be hindered by 8 lanes but as these cards can't be run in Tri configuration this is a none issue. 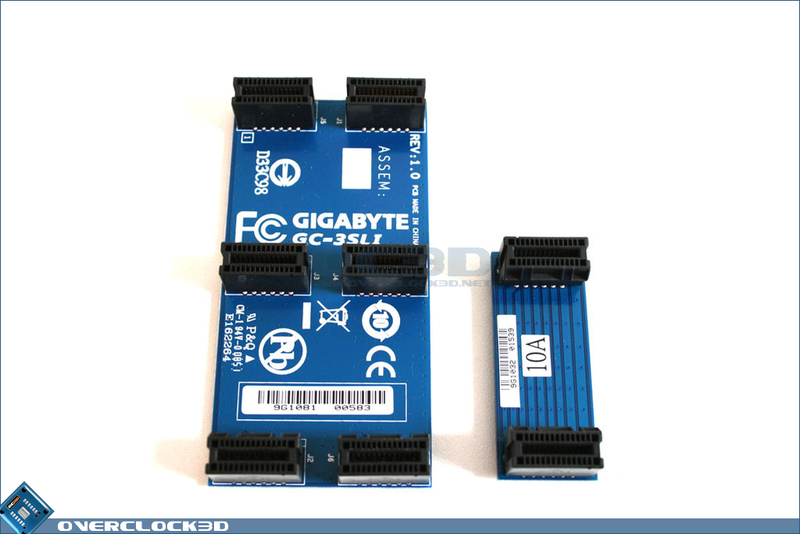 The UD4P is missing 2 SATA parts that it's bigger brother has however, as they are on the Gigabyte SATA2 controller I doubt they will be missed too much, especially as the board still has 6 SATA ports on the Intel ICH10R controller and a further 2 on the Gigabyte SATA2, not to mention the eSATA ports available. 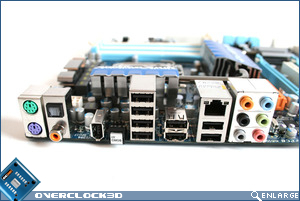 The I/O area of the boards has plenty (8) USB ports, a single Gigabit LAN port, 7.1 audio courtesy of 6x 3.5mm jacks, S/PDIF, Firewire and 2 PS/2 ports. 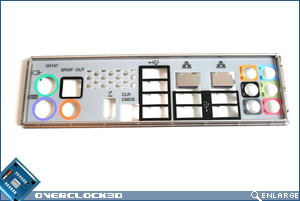 There's also a handy CMOS reset button allowing the user to reset the BIOS should the settings create instability. 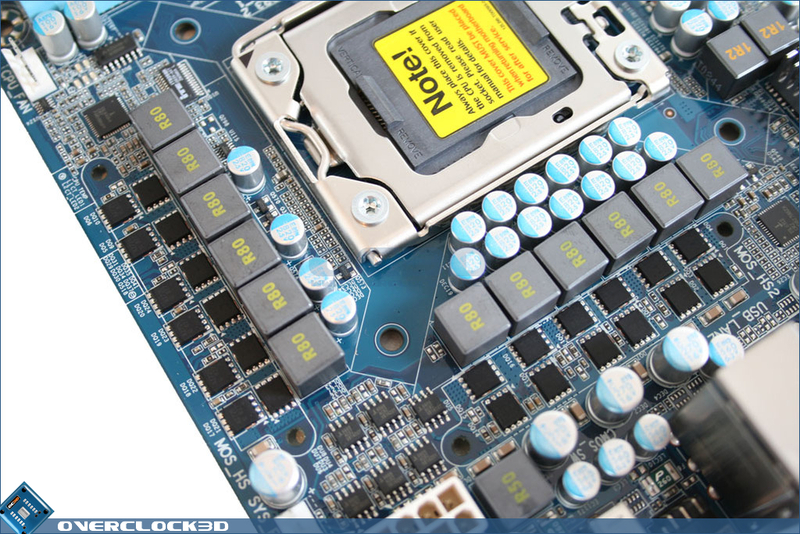 Toward the bottom of the board there are two USB sockets and a further two fire wire ports. 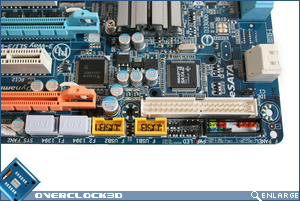 The motherboard header area is colour coded to ensure ease of connection but sadly no quick connector is provided. 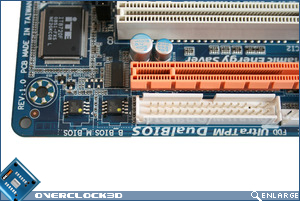 Above these is an IDE port that while rapidly becoming obsolete is still frequently used by those with older hardware. 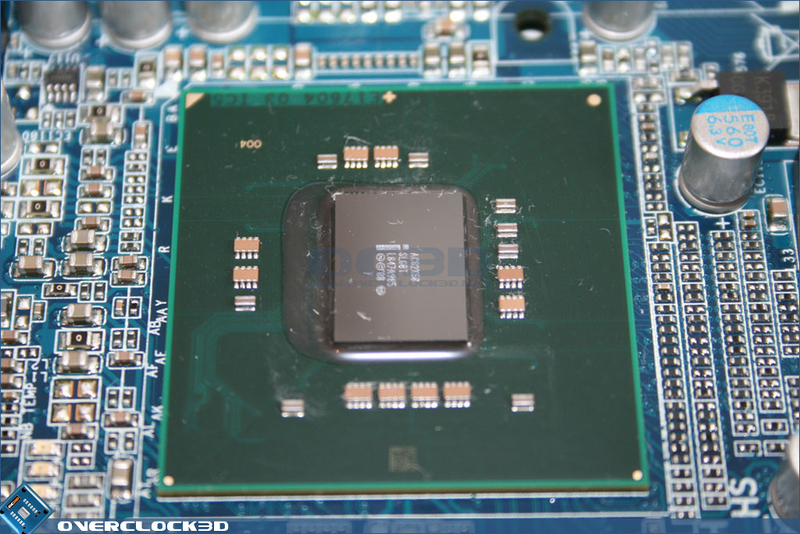 The UD4P features 2 BIOS chips that can recover a corrupt flash with the redundant BIOS chip re-flashing the corrupt one should the need arise. 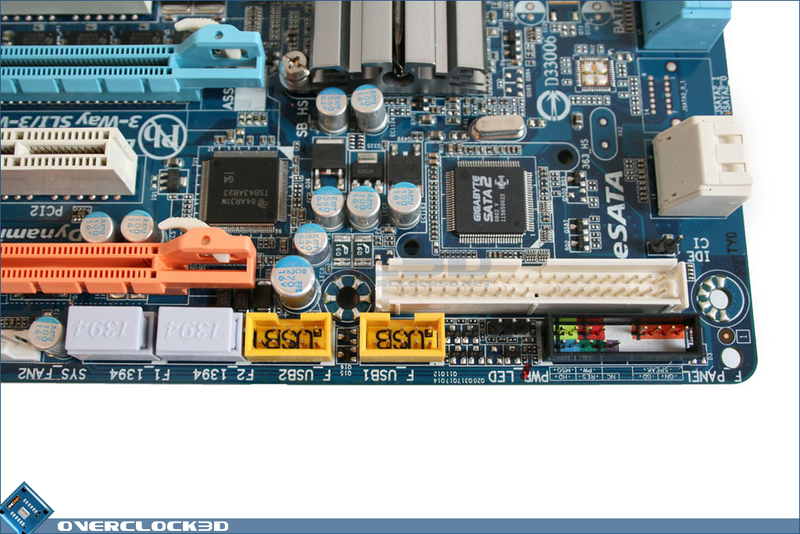 Next to these chips is a floppy drive port. 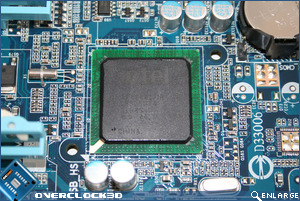 While the floppy port is rarely used for anything other than a BIOS flash these days, some people swear by this method of BIOS flashing and are reluctant to try any other method. 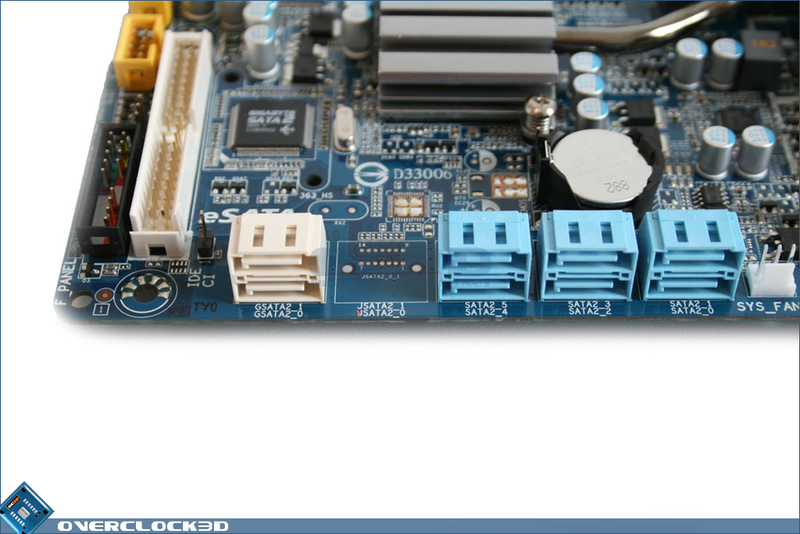 To the top right of the board is a power on/off and reset switch. 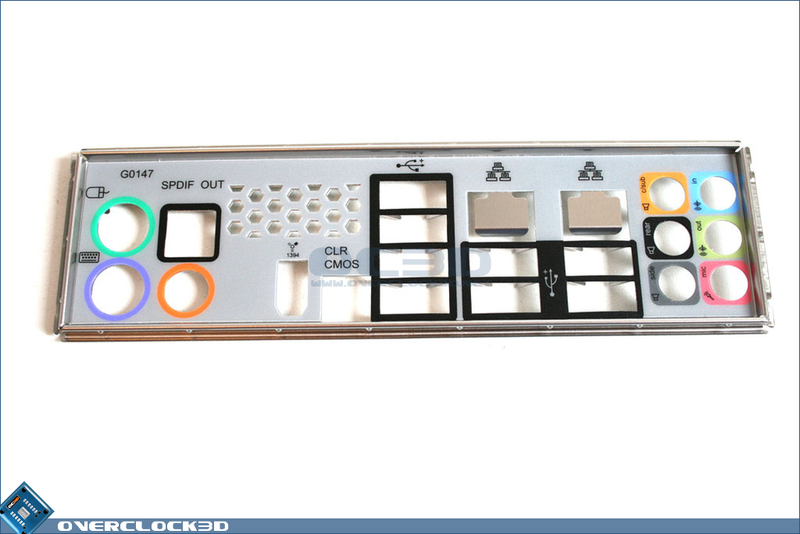 I would liked to have seen the reset switch be something more than a tiny little button as it can be fiddly to use. 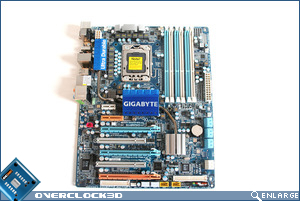 Never the less it's great that Gigabyte have considered those who run motherboards out of the box so to speak. 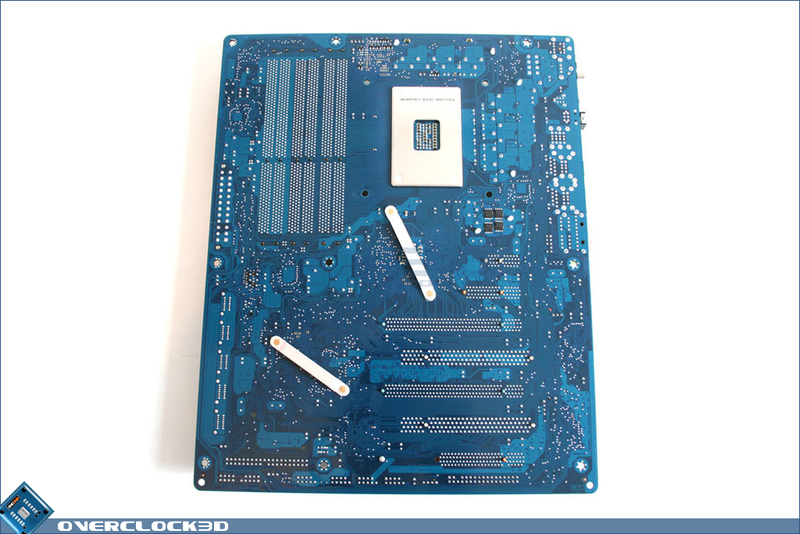 Removing the Aluminium heatpiped which snakes along the motherboard was a relatively simple affair with the two Mosfet coolers being a push pin design and the QPI (NB) and Southbridge held fast by spring loaded screws. This design ensures that there is a near perfect mount and thanks to the generous amount of paste used the mount was indeed very good. 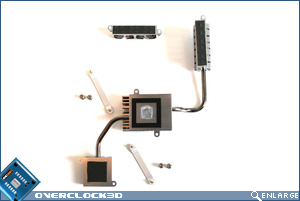 The Mosfets transfer heat by the means of thermal tape which again is the perfect material for the uneven surfaces of the Mosfets. 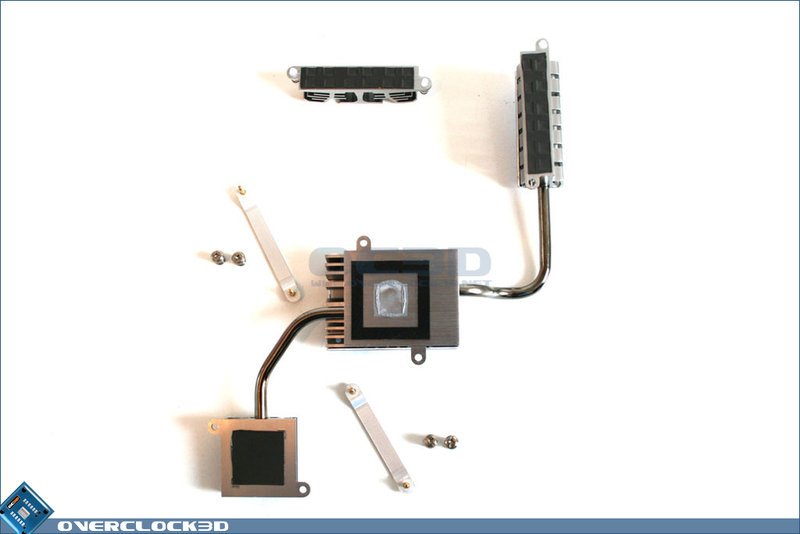 Sadly, one area which has seen a budget restraint is the heat sink cooler. On the surface, the gun metal grey looks attractive enough but the Aluminium material used is not as good as copper for transferring heat. 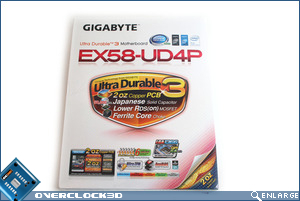 Hopefully this won't have too much of an effect on the cooling of the motherboard as the thick finned cooler certainly does not have as much surface area as the more expensive Gigabyte boards. 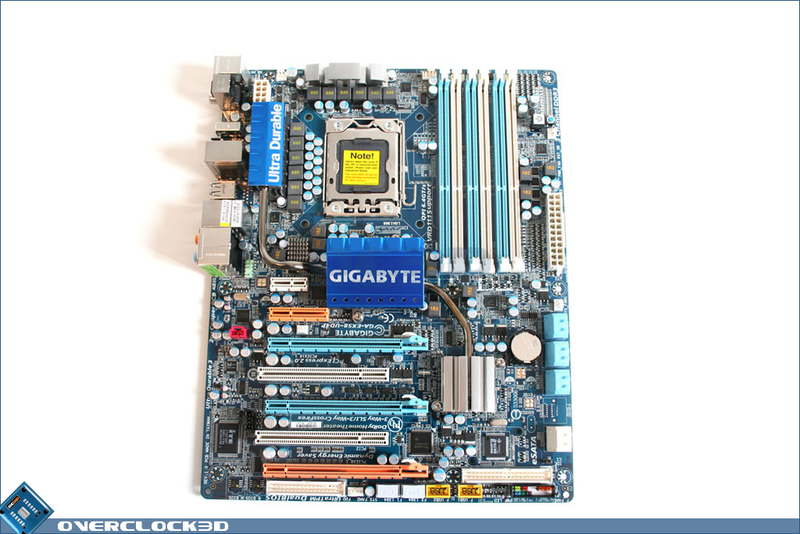 So there you have it, a very attractive motherboard with only a few discreet differences between it and the UD5. 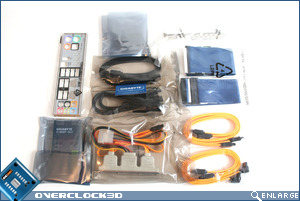 The packaging could be improved, especially in the way the accessories are packaged as they are simply separated from the motherboard by a loose layer of cardboard. 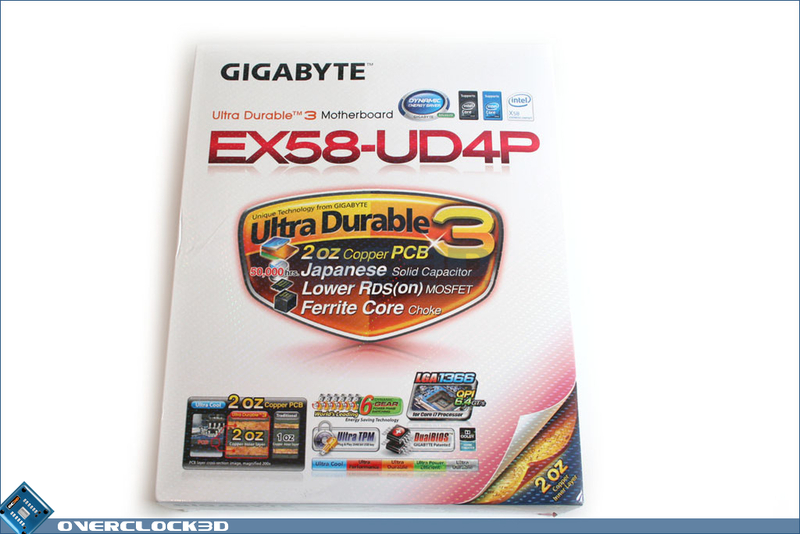 This is packaging at its most basic and something Gigabyte would do well to change as they are slowly falling behind in this area when compared to other manufacturers. 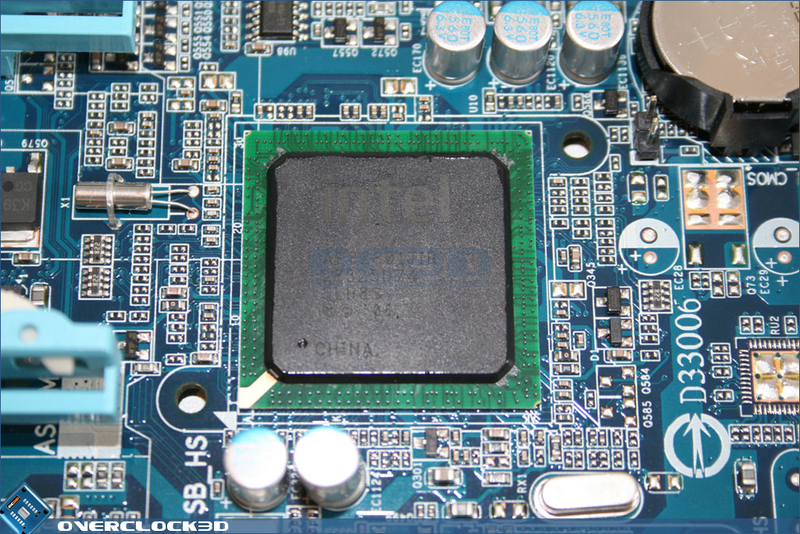 Beauty is only skin deep though and thankfully there has not been too much cost cutting where it counts, the motherboard itself.